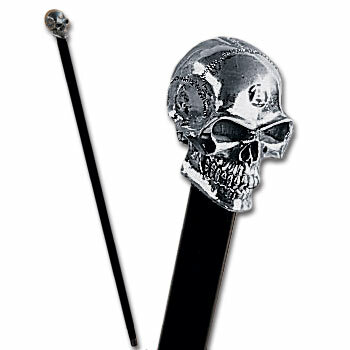 Sinister sophistication is offered in this highest of quality walking canes. The solid hallmarked sterling silver handle (resin filled for strength) is mounted upon a hand made maple shaft, classically black lacquered and metal tipped. Sophisticated gothic elegance for discerning and imposing gentlemen of taste. These items come to us from England. It takes about 2-5 weeks from the time you order items to the time you receive them. We recommend ordering with that in mind to avoid being disappointed.